In a similar fashion to last year’s special feature for International Women’s Day, SNAPD is once again dedicating space in their March edition to celebrate the contribution of women in communities across the GTA. This year, they have added a special section devoted to spotlighting female Community and Business Leaders! Why is this so important to Master Mechanic? In addition to supporting anything that celebrates the contribution of women, our very own Josie Candito was selected by SNAPD to be one of the eight Community and Business Leaders featured. Are we surprised? Not really. Are we thrilled? YOU BET! 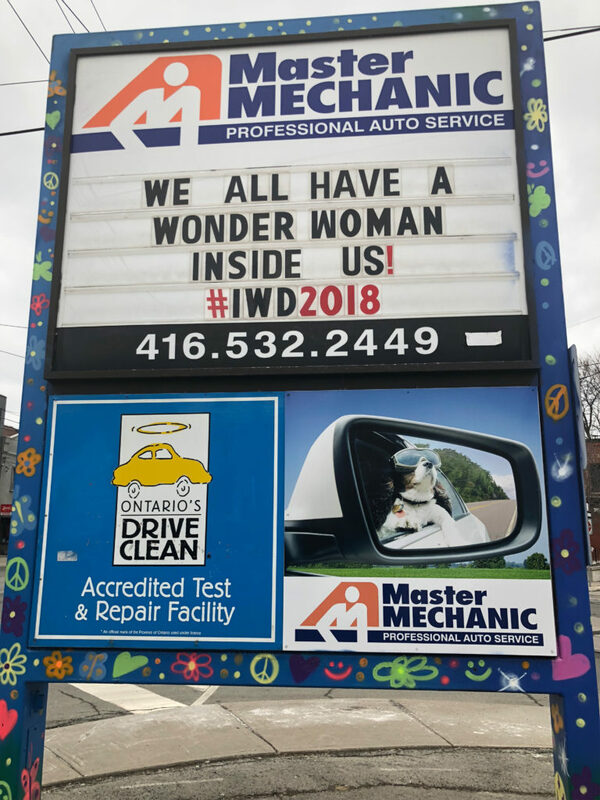 As the co-owner of Master Mechanic High Park for nearly 19 years now, we’ve witnessed Josie’s unwavering strength, generosity and commitment firsthand. Community is woven into almost every facet of her business, and she is among Master Mechanic’s most passionate franchisees, male or female! In addition to running a business that’s a staple in the community, Josie uses her platform for good, lending her time to initiatives, charities, and fundraisers within the High Park area. This award is not Josie’s first time being recognized either. Her personality–exemplified by her trustworthy team of technicians–has earned Master Mechanic High Park the #1 Auto Service Centre ranking from NOW Magazine for not one, not two, but three years running! Her Lead Technician, Rui Silvestre, was also chosen for CARS Magazine coveted Technician of the Year Award. Her work with cancer charities, Redwood Women’s Shelter, SickKids Hospital, the Jane Goodall Institute, and Parkdale Food Bank recently earned her national recognition when she received the prestigious Change Makers Award in honour of Canada’s 150th Anniversary. The award was presented to a handful of Parkdale-High Park residents in recognition of their invaluable contribution to the community. As an advocate of community outreach programs and initiatives, Josie sponsored local Outdoor Movie Nights in Sorauren Park. She turned her love of dogs into WOOFEST–a community celebration of dogs which has raised $12,500 for local charities! She’s a voice for kid’s support programs and women in the Automotive Industry, helping to shatter stereotypes and break gender barriers in the male-dominated field. On a more a personal level, many of her female customers feel more comfortable dealing with a shop owned by another woman, and she’s happy to offer that added confidence. For the last few years, she has even lent her store signage to aiding the community at large. With heartfelt messages of encouragement, she motivates people and brightens their day. This winter and last, the sign was used to hang scarves, another initiative dreamt up by Josie to provide a little warmth to those that needed it, and something we emulated at many other locations. Two years ago, the sign took on different purpose when a mechanic shop in New Annan, P.E.I., posted a joke on the sign outside: “Women are like snowflakes. They can’t drive.” When Josie spotted a picture of the sign on social media, she felt compelled to respond. The next day she posted a sign that read “Mellish Motors. My Canada includes respect for women! #WomenCanDrive.” It was a gesture that was appreciated by many and sparked a lot of debate. Josie is an exemplary person on a daily basis. She’s not only a voice for women and children, but for the equality of all–including animals. Check out Josie’s feature in this month’s issue of SNAPD, or pop in to say hi. She is a real entrepreneur and philanthropist in the community with a top-notch automotive shop!